The Runnin’ ‘Dogs’ win against Del Norte Saturday at Bulldog Pit wouldn’t necessarily be described as pretty by conventional standards. But what it lacked in crispness it made up for in the ultimate standard: effectiveness. The Artesia boys overcame a slow offensive start and an at times detrimental combination of easy misses and unforced turnovers to defeat the Knights by 10, 52-42, on their home court and complete a weekend sweep that began with a 56-44 win over Los Alamos Friday night. The Bulldogs took an early lead in the opening quarter Saturday on a reverse layup by Devon Torres and a Bryce McAlister jumper. Another perimeter shot from McAlister, an Alan Cosio free throw, and one under the basket by Taylor Null – combined with solid defense that limited the Knights to just a pair from the field in the quarter – would keep Artesia out in front heading into the second, 9-5. Following a Caleb Dean layup to open the period, Del Norte was able to tie things up at 11-all with just over three minutes remaining in the half. But an old-fashioned three-point play from Cosio and a pair of free throws apiece by Torres, Dean and Ethan Duff bumped the ‘Dogs’ lead back to nine, and a Null shot in the paint and two more from the stripe by Cosio countered a seven-point effort in the final moments by Del Norte to make it 24-18 Artesia at the break. With five points from Torres and a Dean trey, the Bulldogs would compile their first double-digit lead of the night with just under six minutes to go in the third. But the Knights closed out the quarter on a 9-2 run to move back within striking distance going into the final eight minutes, 35-29. A Null layup was answered by a three from Isaiah Mejia to make it a five-point game, 37-32, and Jalen Thompson followed a Dean free throw with an offensive putback to bring Del Norte within four, 38-34. But back-to-back baskets by Joe Willingham, followed soon after by a jumper and a trey from Tyler Greenwood, gave the ‘Dogs 10 points of breathing room going into the final two minutes of play. And although the Knights managed a trey and a layup, Artesia was able to answer from the stripe to maintain that margin through the horn, 52-42. 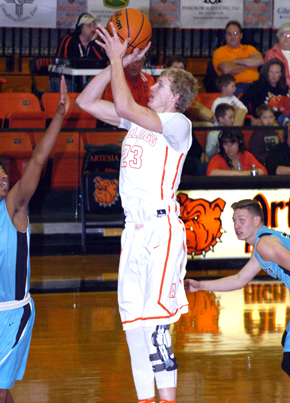 Dean finished with 11 points for Artesia, followed by Torres with nine and Null with eight. Cade Wilson posted 11 for the Knights. The ‘Dogs shot 47 percent from the field on the night and 59 percent from the line, to which they made a whopping 34 trips thanks in large part to Del Norte’s aggressive style of play. With the weekend wins, the Bulldogs moved to 12-4 on the season and, most importantly, added another pair of Class 5A notches to their belt. “I still think we haven’t played our best games yet, and that’s the good thing,” said Mondragon. “To say you’re 12-4 and still not playing your best is good. There are a lot of things we need to get better at, but I couldn’t be prouder of these guys. They’re developing. Like I told them in the locker room, on the sideline, and in the team room, what I love about our team is that almost every night, a different guy steps up and plays well when we need him to, and as long as we continue to have that depth and continue to have 13 guys stepping up, we’re in good shape. The ‘Dogs will join the Lady Bulldogs Tuesday in heading to Carlsbad for Part II of the annual Eddy County War series. The Artesia girls are set to tip off at 5:30 p.m. with the boys to follow at 7 p.m. The Bulldogs edged Carlsbad 46-41 Dec. 20 at Bulldog Pit, meaning the Cavemen will no doubt be raring for revenge Tuesday. “It’s the Eddy County rivalry,” said Mondragon. “It’s a win-win for us because it’s a 6A team, Carlsbad is taking a break from their district schedule, and this is another game that will allow us to work on all the things we need to improve on as we get ready for district and for another 5A weekend coming up. The Bulldogs overcame an out-of-sync first quarter Friday against Los Alamos with a solid second, building a lead they were able to expand to double digits in the early goings of the second half, then maintain through the remainder of the bout. Turnovers and easy misses combined to hinder the ‘Dogs in the first eight minutes. After jumping out to a 6-2 lead on a pair from the free-throw line by Joe Willingham and a bucket apiece from Devon Torres and Caleb Dean, Artesia managed just three more points in the period to the Hilltoppers’ 11 to trail by four, 13-9, heading into the second. There, the Bulldogs stepped up their defensive pressure, forcing nine ‘Topper TOs that helped hold Los Alamos to just six points in the period. The ‘Dogs, meanwhile, hit a trio from beyond the arc – two courtesy of Bryce McAlister and one from Chaney Hardt – and rounded out their 15-point showing with baskets by Hardt, Dean and Taylor Null to take a five-point edge in at the break, 24-19. Willingham opened the third with an offensive putback and a pair from the stripe, and shots in the paint from McAlister and Null bumped the ‘Dogs’ lead to 11, 32-21, as they continued to limit Los Alamos’ offensive opportunities. McAlister and Torres logged breakaway layups that were followed by a Dean trey, and Artesia headed into the fourth on top by 13, 43-30. Tyler Greenwood put back an offensive board and drained a second shot from downtown to make that 18 as the fourth quarter began, and the Hilltoppers could not recover from there. A second Greenwood trey midway through the period made it 54-36 Artesia, and although the ‘Dogs’ final bucket of the game – a shot in the paint by Alan Cosio with around two minutes to go – was surrounded by eight points from Los Alamos, the damage had been done in the 56-44 victory. 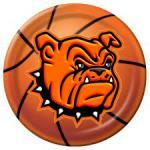 Dean finished with 11 points to lead the Bulldogs Friday, followed by McAlister with 10 and Greenwood with eight. The ‘Dogs shot 44 percent on the night. Los Alamos’ Jack Stewart led all scorers with 13.